As a mom of four boys, I see nothing but stains when I am doing the laundry. In fact, the lighter the article of clothing, the more stains you can bet it has. It is as if a dirt magnet is litterally attached to my boys' bodies when they wear the color white. I have tried a ton of different products through the years to try and get their clothes completely clean, and have had various measures of success and failure. 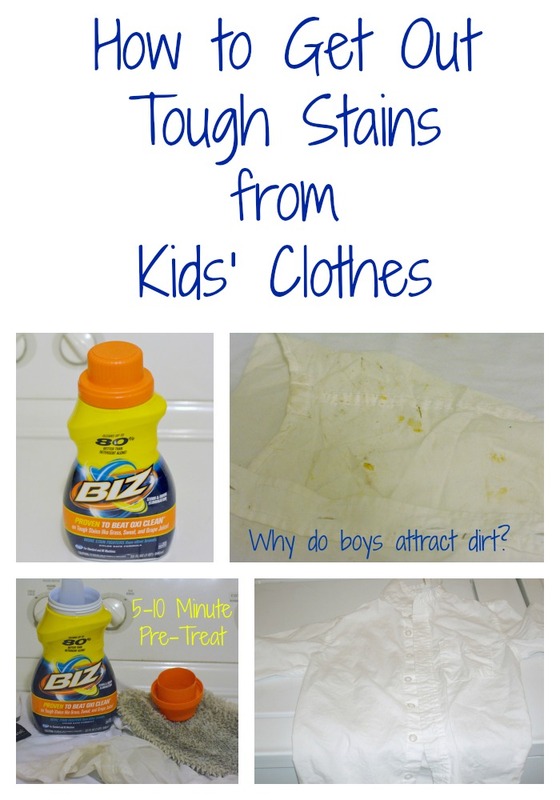 When I was asked to take the #BizChallenge and give the revamped Biz Stain Fighter a try, I was excited to see how it would handle the tough stains on my boys' clothes. We all pretty much grew up knowing about Biz, I can remember seeing it on the shelves even at a young age. That same great stain fighting formula that many moms and grandmas have used for years is still around, it has just undergone a huge packaging facelift, with new colors and design. Snazzy huh? It is still a powerful product. Biz contains more stain fighting ingredients than other leading brands, and it has been proven to remove stains up to 80% better than just using detergent alone. What is the Biz challenge? Well, basically, it is to find your toughest most caked in stains, try Biz and see what happens. Now, you can use Biz as an add-in to your laundry with your detergent, or you can use it to pre-treat the stains for 5-10 minutes before throwing the clothes in the laundry. Since I have boys that are tough on clothes, I did both. Take this shirt for instance. It used to be a white button up dress shirt. Don't ask me what the stains are, I have no Earthly idea. In fact, I am 99.9 percent sure I don't want to know what they are. I pre-treated this shirt with Biz for 10 minutes, and then added it to a load of laundry that had a capful of Biz added for extra stain fighting power. Did it work? See for yourself. The answer is yes! We now have a white shirt once again. I was pretty impressed with how well Biz performed on these tough caked in stains. I am pretty sure that shirt had been wasting away at the bottom of the dirty clothes basket for a while. In the end, I definitely intend to continue using Biz in our laundry loads, and to pre-treat tough stains. 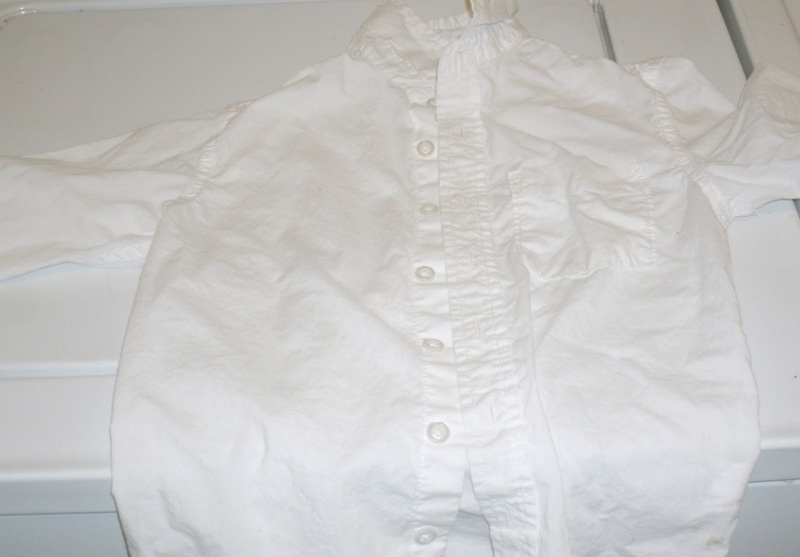 It may not always get the stain 100% out, but it cleans way better than regular detergent alone, and helps restore my boys clothes back to the color they were intended to be. You can save $1 on Biz and take the #BizChallenge for yourself. For the latest information on Biz, check them out on Facebook and go to their website to see where to buy Biz. Have you taken the #BizChallenge yet? Wow, seriously? I've been searching for something like this, like forever! I normally use OxyClean which is great on light to medium stains, but this looks like it would tackle the bigger ones, too. I'm definitely adding this to my shopping list. That is impressive. I only have one child and she's a girl but, wow, she gets spots on everything. I have to try this! Wow. I have never seen this product before. Of course, we've been very loyal to three laundry brands my entire life so I don't even look at what's on the shelves around them anymore. This is quite amazing work. I love products that are reliable and good at getting rid of stains because like you mentioned boys know how to create them! Thank you for telling us about this. Crystal, I was very very impressed with Biz. It works amazingly well on new stains that have not been washed and dried in before. If you try to use it on something that was stained and you already washed and dried in the past, you will see a noticeable difference, but it will not always get the stain 100% out. That is the case with the pad for our Shark steam cleaner. Biz gets it cleaner, but since it has been stained and washed in the past, so Biz can't get it sparkling clean, but there was a huge difference using the Biz. Ok, I eed to try this for my boychild. I swear all he does is attract dust. This Biz Stain Fighter looks great. It's perfect for the kids' clothes. It seems like at least one of my three children is always getting a stain on an important piece of clothing. I definitely need to put Biz on my grocery list to have on hand! All my kids from 13 down get stains on their clothes, I should try Biz Stain Fighter! It is hard to get anything 100% out! Wow, it did a great job! I seriously can't even believe how well it cleaned that shirt! I wish I'd known about this when I was trying to clean the mess my husband used to make on his work shirts!